Chepstow's beautiful Riverside Gardens with their ornate Bandstand are the perfect setting for lazy summer Sunday afternoon listening to great music by a range of local, and not so local bands. 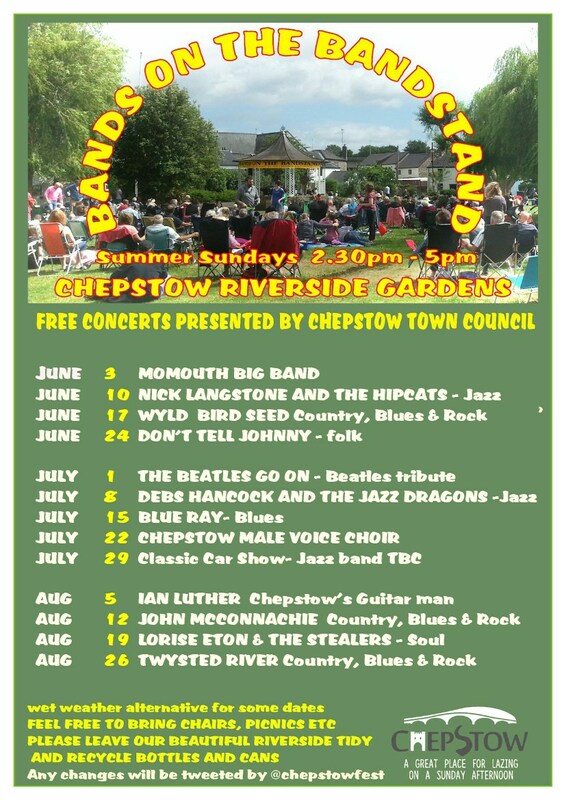 11 free concerts funded and organised by Chepstow Town Council provide a wonderful opportunity for family and friends picnics. There are splendid views of the river and Chepstow's famous 1816 early Iron bridge, an opportunity to marvel at the second highest tidal range in the world in the River Wye in Chepstow, refreshments are available from the Riverside Wine Bar and the Boat Inn. There is a wide range of music to suit many tastes, for some Sundays the Drill Hall is available as a wet weather venue. In the event of bad weather being forecast the decision to perform or not outside or the wet weather venue if available is made in the late morning on the day of performance. Any such decision or any other change of programme is communicated via the Chepstow Festival Twitter feed @Chepstowfest.